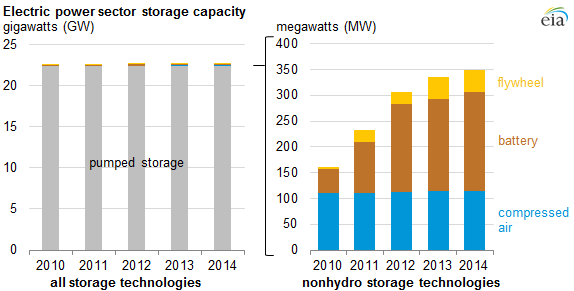 Although pumped hydroelectric storage makes up most of the total electricity storage capacity in the United States, nonhydro storage has doubled in electric power sector capacity from 160 megawatts (MW) to nearly 350 MW over the past five years. About 98% of the U.S. electricity storage is pumped hydroelectric storage, where water is pumped to a higher-elevation reservoir during off-peak demand and then run back down through a turbine during peak demand. However, pumped storage facilities are expensive to build and have specific siting requirements, making additional capacity builds in pumped storage infrequent. Nonhydro storage systems, which include compressed air, batteries, and flywheels, can provide several ancillary services to the grid, including regulating the grid's frequency on a second-to-second or minute-to-minute basis and fast-ramping capacity to cover sudden and unexpected gaps between electric demand and supply. The economic value of these services is beginning to be captured in the price of wholesale electricity through several recently implemented policies. Several recent Federal Energy Regulatory Commission (FERC) orders support the use of electricity storage by creating or improving market incentives for these ancillary services. Order No. 755 (2011) improves compensation rates in wholesale electric markets for fast-responding resources. Order No. 784 (2013) adds a requirement for utilities to account for the speed and accuracy of regulation resources (which help balance power system load and generation within minutes) when they determine reserve requirements. The order also requires utilities to report financial and operational information on energy storage assets. Order No. 792 (2013) amends an earlier rule to include energy storage technologies and to streamline the time and cost associated with interconnecting new energy resources. States have actively begun developing energy storage-related policies as well. California created an energy storage mandate in 2013 that requires its three largest investor-owned utilities to add a combined 1.3 gigawatts (GW) of energy storage to the grid by 2020. The state also created a demand response and energy efficiency roadmap with a number of new objectives, one of which focuses on demand load shapes and includes additional opportunities for energy storage. In 2014, New York proposed a new platform for energy delivery, Reforming the Energy Vision, which discusses the need for a competitive marketplace for distributed technologies, including energy storage. Government agencies are not the only entities devoting attention to energy storage services. Hawaiian Electric Co. (HECO), the utility serving most of Hawaii's population, issued a request for proposals last year for 60 MW to 200 MW of storage to help manage the solar and wind generation on Oahu's grid. Oncor Electric Delivery, a major electric service provider in Texas, recently released a report titled The Value of Distributed Electricity Storage in Texas and proposed to install up to 5 GW of battery storage capacity beginning in 2018.